Yesterday I received a hefty fine I couldn’t afford. It was for £22,000 and doubled every 24 hours. I had (or I felt like I had) nobody to support me, I had nowhere to go and had little money so I planned on killing myself. Okay, so that didn’t happen in the sense that it was a dream (the classic GCSE English story ending). But the dream still occurred as such. 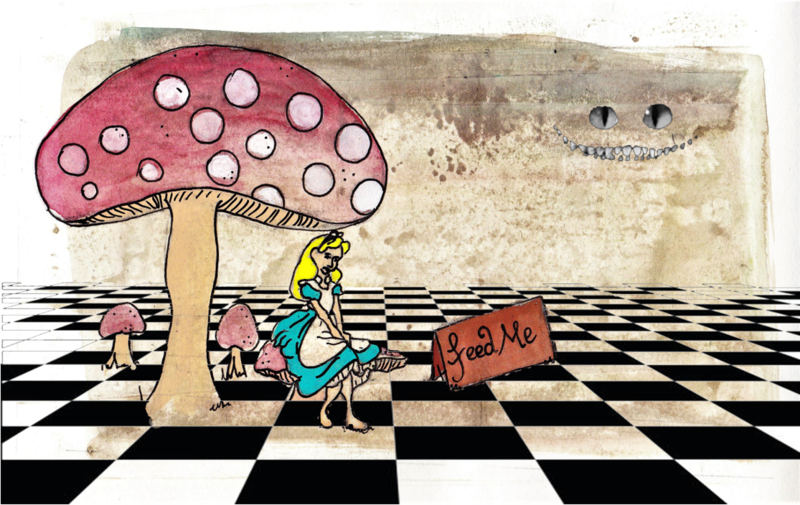 A few weeks ago, I had the pleasure of seeing Alice in Wonderland, performed in the wondrous caves of Kent’s Cavern. We were enthusiastically yet hurriedly led around the caves by the Chesire Cat, thinking that we were going to be eaten by the Jabberwocky. After watching The Butterfly Theatre Company’s fabulous production, I became curious about the concept of dreams having some kind of effect upon the way we perceive ourselves and the world around us, our thoughts and actions. How dreams and reality can be interwoven. This morning, I had awoken with many ideas – partly because of this dream. It would be appreciated if I could share them with you. I thought to myself that if I had had a house, I might have had to sell it in order to pay that ridiculous fine. Then I may have become homeless. All because of a mistake. It could easily happen to any of us. If it happened to me, I wouldn’t want people to make assumptions, just because of my situation. And, if I did dabble in drink or drugs because I’d hit a low, that wouldn’t take away all the good things I’d done in my life or make me a bad person. So, why should we judge others? If we wouldn’t want people to judge us, what right do we have to judge them? Why do we dehumanise others? Like racists would horrifically refer to people using animalistic terms, aren’t many doing a not-too-dissimilar thing now by treating homeless people like unwanted, abandoned pets and ignoring them? 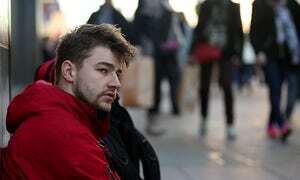 James Beavis, a medical student, fed up with how homeless people are treated, recently spent a month sleeping rough in London to learn more about what it is like and raise money for charity. He concluded that ‘society has dehumanised homeless people‘ (Beavis, 2017). Read the article here. Dehumanisation and intergroup discrimination aren’t new concepts. Over the course of history, people have tried to raise their status by negatively highlighting, overemphasising and inventing differences of those in other racial, religious and cultural groups. This subsequently makes the others become the ‘outgroups’ and the bullies become the ‘ingroup’ (Turner, 1975; 1978). These people often make the ‘outgroup’ appear subhuman. Dehumanisation has been made evident over centuries, cross-culturally. 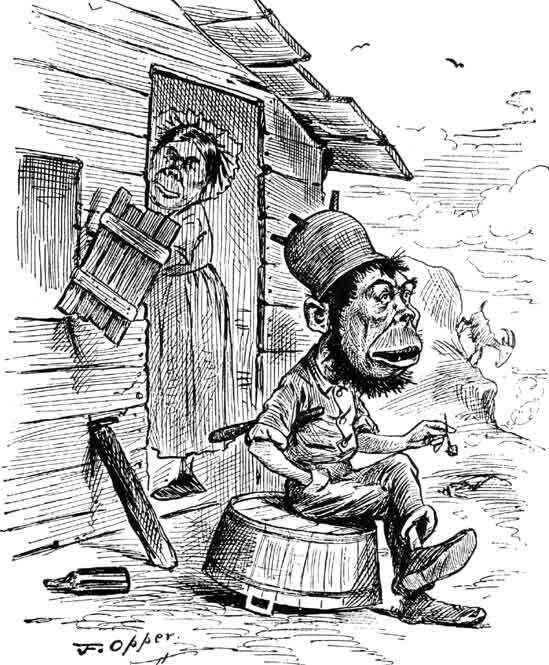 For example, Irish people used to be cruelly painted (sometimes quite literally) as apes. Dehumanisation has also been lexically-portrayed by well and lesser-known writers, over centuries. I remember being horrified at school when Iago referred to Shakespeare’s (1603) anti-hero Othello as a ‘black ram’. At university, I was enraged at how Joseph Conrad’s Heart of Darkness (1899) was riddled with dehumanising terms. A citizen of the Congo, Okonkwo, was referred to as an inhabitant of ‘prehistoric earth … that wore the aspect of an unknown planet‘. Hogg and Vaughan have stated that ‘if people can be viewed as less than human, then atrocities against them became essentially no different to squishing an insect‘ (Hogg & Vaughan, 2005). In addition to people dehumanising others to lower their status and increase their own, they also do so to make the horrendous treatment towards these beings seem less inhumane. By thinking their treatment is no worse than squishing an insect, they have attempted to remove guilt of their actions, and pretend that everything is a-ok and justified because the others are subhuman and don’t deserve the same human rights as them. We may think that we have come a long way since the old examples mentioned above. But how far? A recent study has highlighted that many Trump supporters dehumanise Muslim and Mexican people (Kteily, & Brunei, 2017). American participants were given the famous ‘Ascent of Man’ picture and were asked to place certain groups in their ‘appropriate’ place. Many Americans (mainly Trump supporters) consider Muslims and Mexicans as less evolved than them. The irony. Also more recently, Netflix has kindly provided us with modern-day examples of how twenty-first century people are dehumanised and deindividualised. Before Orange is the New Black even starts, our ears are treated to Regina Spektor’s ‘You’ve Got Time’ (‘The animals, the animals … trapped, trapped, trapped, ’til the cage is full…’). Jenji Kohan’s popular series captivatingly exemplifies how stigmatised groups are treated inhumanely. In series 4, a certain lovely character is forced to eat a baby (/almost foetal) mouse, by a twisted officer. Guards abuse those in their care willy-nilly, in a fashion reminiscent of the famous Stanford prison experiment (Haney & Zimbardo, 1973). Kohan’s crafted clever and kind souls are treated horrifically, mainly just to release dopamine in officers’ brains and to give them strange, sadistic kicks. Towards the end of season 4, ‘inmates’ are made to stand on tables for hours on end and must urinate (etc) in front of the others. They are humiliated, starved and weakened because they try to ‘stand up’ for themselves and others. This isn’t a far cry from when prisoners were publicly showcased and humiliated in pillories. 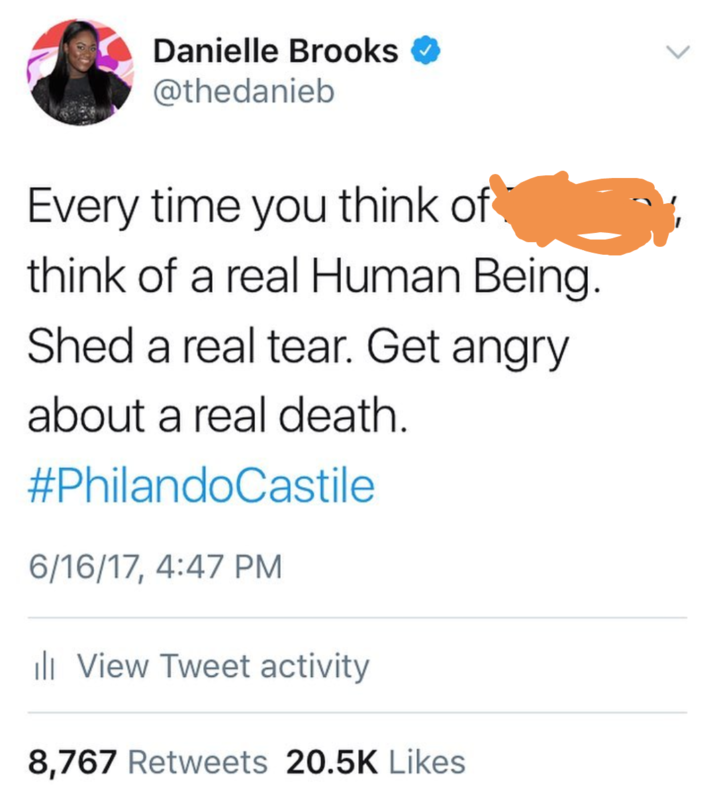 Brooks was also raising her Twitter feed’s awareness of Philando Castile, a young man who was unfairly shot by a policeman last year. Examples of dehumanisation and deindividuation may often seem like ‘mere’ words to some; however, words, thoughts and behaviour are undeniably interlinked. It is easy for words to escalate to sticks and stones. Words reflect attitude. Words and attitudes spread. Attitude and behaviour go hand in hand. Dehumanisation and deindividuation act as catalysts for discrimination, violence and even death. We are able to see this, not only on TV, Netflix and in the news, but around us. Homeless people are 17 times more likely to be victims of violence than people with stable housing (Beavis, 2017). A few of these verbal examples are similar to how people categorise and deindividualise people living on the street. How many times have you heard ‘he/she is just ‘some bum’ /’tramp’/’beggar’? Similar unkind, deindividualising and status-reducing terms are evident cross-culturally. Homeless people in Spain are often referred to as beggars (‘Mendigos’), whereas, it’s common to refer to them as ‘the displaced’ in Colombia. In the boot-shaped land of love, homeless people are often not treated lovingly. They are commonly called ‘barboni’, in Italy, which is a derogatory term that translates to ‘people with long beards’. Even homeless women are known as barboni (bearded or not). In Romania, many homeless people are referred to as ‘boschetar’. This is a deindividualising term that paints them as horrible, sneaky and untrustworthy. ‘Boschetar’ pretty much translates to ‘person living in the bushes’. In Switzerland, the things homeless people are referred to literally translate to ‘dirt’ and ‘dust’. It gives an entirely different meaning to the Kansas song. Additionally, some Swiss citizens even say ‘du bist der letzte Dreck’. This can’t be directly translated to English, but it is a similar way of saying ‘you are worse than dirt’, ‘you are forgotten dirt’ and ‘you are less than dust’. If I call my neighbour by his name, ‘David’, or my local coffee pro by his name ‘Tom’, they don’t look too shocked. Conversely, if I remember Ben’s name (a local lad who happens to currently be without a roof over his head), he looks surprised. Arguably, this may serve as a visual marker of deindividuation. How homeless people feel like components of their individual identity are less emphasised than those with different housing situations. Oh, what a rarity, to hear one’s own name! To remember that one does indeed have a name! That one has a personal identity and lots of little quirks in addition to that name! If you wouldn’t hear your name called for days, weeks, even years on end, how would you feel? If nobody knew you or even tried getting to know you, how would you feel? Hearing one’s own name is undeniably important when it comes to self-identity, self-representation and self-esteem. It is also important neuropsychologically. Studies have shown that hearing our name activates numerous parts of the left hemisphere of our brain. This includes the middle frontal cortex and middle and superior temporal cortex (Carmody and Lewis, 2007). If we aren’t called by our names and communicated with, this can have a negative effect on the brain, as a significant part of it will be activated less or may even cease to be activated at all. And to rewind back to dehumanisation, aren’t we doing something similar to homeless folk by treating them like abandoned pets (although they often get rescued more easily)? But, then again, maybe we shouldn’t be so hasty to solely judge the judgers, without first further picking apart the judgement itself? Judgemental, discriminatory and hateful people are often just scared beings that end up using stigmatisation of different groups as a weird comfort blanket. Katz (1960) proposed that a big part of our attitude stems from ego defence (protecting one’s own self-esteem). Groups have been comparing, competing and putting one another down for yonks. This has been a widely-researched field in psychology, with researchers delving into ‘us’ and ‘them’ polarisations, in-groups and out-groups, discrimination and downward comparison between groups (Hogg, 2000c; Turner, 1975; Turner, 1978). We can see examples of these everywhere. On the street. In secondary schools. At football games. On Facebook. In staff rooms. In politics. In Harry bloody Potter. Some individuals and groups are lacking in confidence and filled to the brim with hatred and insecurities; they prefer to weaken their opponent(s) by putting them down and attempt to increase their own confidence by painting others as weak. Some have a cup of tea when they are feeling low. Others raise their own egos by squashing someone else’s self esteem. And some find that even easier if the person or group in question seems different. Others may already be aware of the fact that homelessness could happen to ANY of us. I’ve met homeless people who have come from rich families and the military, have had professions, degrees, farms, marriages, children, their own businesses, won awards, worked, volunteered and paid taxes. By making false assumptions about people (how often do you hear ‘well, they are obviously just some druggee’, ‘well, they like, choose to be there, yano?’), we create greater psychological distance between ourselves and others. By doing this, we attempt to protect ourselves from fear, comfort ourselves and make us feel falsely secure where we currently are. People try to sit in denial and distract themselves instead of having their eyes open to what’s in front of them and what could happen to them. The modern day monster under the bed for adults is that things like this can happen to any of us. We therefore suit ourselves up in denial and create distance. We create distance between us and those we pretend are so different to us. Newsflash: nobody is that different. We are all just one fine, one accident, one illness, one politician, one disability, one ex, one situation that pushes us over the edge, one attack, one missed bill, one earthquake, one eviction, one needle, one bomb, one fire, one continent, country, county or town away. It could be me. It could be you. Let’s not focus on the negativity and fear that may surround this. Instead, let’s be aware of the truth of situational instability. Instead of cowardly creating distance, let’s lessen it. If you were made homeless because you were made redundant without a good package, or received a hefty fine that you would struggle to pay, would that make you a bad person? No. What makes us good or bad people? What temporarily places us somewhere on the strange spectrum of morality? This jokey imperative exemplified her kindness and generosity; the kind lady was sat shivering next to me because she had given most of her clothes to others around her. So, if we should judge her, we should judge her solely on these acts. But if the looking glass happened to be turned around, facing us, how would people see us? How would people see you? In 1902, C.H. Cooley coined and conceptualised ‘the looking glass self’ which has been considered in more depth since (Mead, 1934). 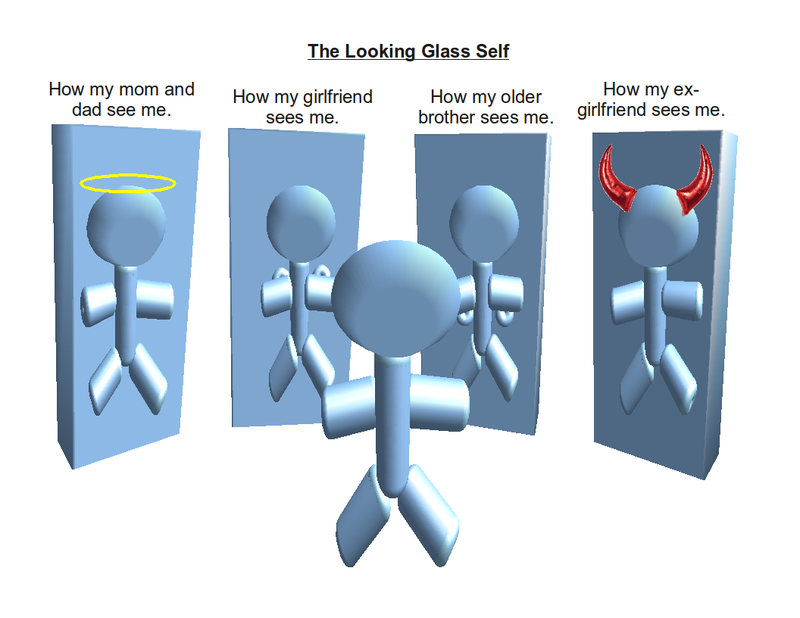 The looking glass self is the idea that our self-concept greatly derives from others. Seeing ourselves as others see us. Considering Cooley and Mead’s looking glass self (1902; 1934), let’s look upon others kindly and less judgementally so they can see themselves in a better light. 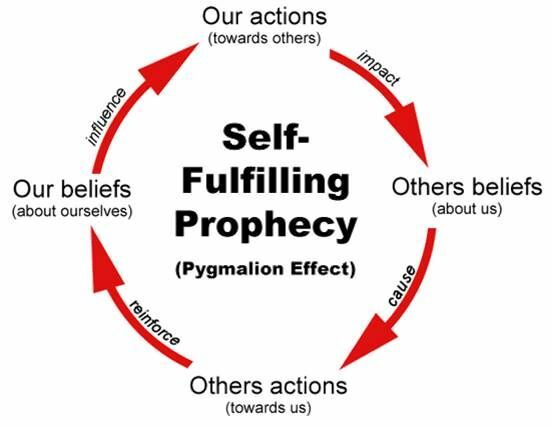 So that they may view themselves more positively and this may subsequently become a self-fulfilling prophecy, in a positive way. Strangely, I was thinking about self-fulfilling prophecies the other day, whilst driving home from work. My heart sank as I saw a man lying on the side of the road. Luckily, a few people were there to help. This should shock everyone. However, such situations are not unheard of. Why do so many people not help? This question has been considered by numerous psychologists (Latané and Rodin, 1969; Latané and Darley, 1968; 1970; 1976). 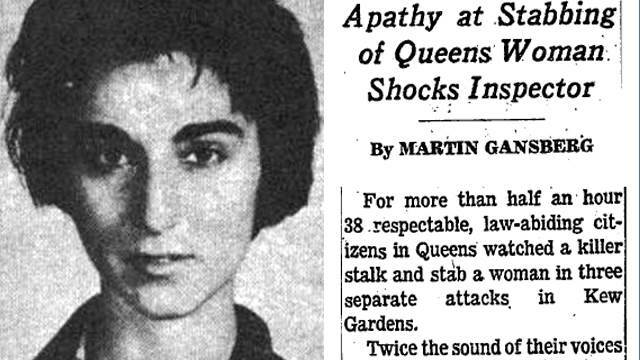 One big catalyst for a wealth of such research was the murder of Kitty Genovese. One New York City night in 1964, a young lady was making her way home from work, when she was brutally attacked, molested and stabbed for over half an hour. During that period, her screams echoed through the supposedly ‘respectable’ neighbourhood. The screams didn’t fall upon deaf ears; 38 people admitted to hearing the screaming. They all had the time and opportunity to help but nobody did. This story became sensationalised and prompted numerous articles and studies. Why did nobody help Kitty? Why did very few help the roadside Devonian? Concepts include ‘the bystander effect’ and ‘bystander apathy’. Studies have indicated that people are more likely to help someone when alone, than when they are in a pair or group. This has been tested shedloads of times with similar results. In 1969, Latané and Darley noticed that when male participants were alone, 70% of them helped a mysterious woman in the next room, sounding like she was in distress. Yet, when they were in pairs, the percentage of helpers dropped to 40%. Potential reasons for bystander apathy include diffusion of responsibility/social loafing (‘yeah, but, like, someone will help… It’s not up to us… Look at all these people … They will I’m sure…’), audience inhibition (some people don’t want to embarrass themselves and be the odd one out) and social influence (if others look apathetic, this is a model for newbies joining a group; people are influenced by the crowd). At school, did you ever watch someone get bullied and not stand up for them, just because you were afraid of not conforming? Did you often convince yourself that someone else would stand up for poor Ben or Louise? That it wasn’t your responsibility? Real life and adulthood can be like an extreme version of just that. One example is the roadside shocker I just mentioned. Just down the road, a few groups were peering at the scene, not getting involved. Just half-heartedly speculating with friends, smoking and eating – like they were watching a mildly-interesting TV show. Although, they didn’t look hugely interested, more apathetic; if it was on ITV they probably would have turned it off after a couple of minutes. There were more people in the apathetic groups that evening than the small group of helpers. If you think about other real life scenarios you have experienced, you may have recalled something similar. Luckily, however, the two guys with the big hearts were there to help. By the time I’d arrived, a small group of helpers had formed, and an ambulance was pulling up. And – good news – apparently he was okay! But sadly, the bystander effect and bystander apathy can be seen on the streets on a day-to-day basis. People will often pass by homeless people without batting an eyelid. Even turning the other way. We are becoming too desensitised to extreme poverty. We are getting too accustomed to ignoring others. We are getting too used to hoping someone else will change things instead of stepping up and making small changes ourselves. We are getting too comfortable in denial and blissful ignorance. Some of the people we pass by may not have blood clearly gushing out of their skulls, but many are slowly starving, sick, disabled, have mental health struggles and/or have important medical bills they can’t pay. Are we, the general public, that different to the people ignoring the elderly man on the road, if we ignore others who are struggling, just if it’s not so easy to see? Some say ‘but, like, I can’t do nuffin’ – I’m just one person’ (similarly to the voting shabbang). We might think that we are small and that our individual actions can’t make a difference. However, that couldn’t be less true. ‘If you think you are too small to make a difference, try sleeping with a mosquito’. Think about a time that you had hit rock bottom (or pretty low if you haven’t hit rock bottom). Did one friend, one family member, one teacher, one student, one neighbour or one stranger reach out? Did they say or do something (a smile counts) that made a difference to you and your well-being – even if it seemed small to others? We are all responsible for the things that breathe on this planet of ours. 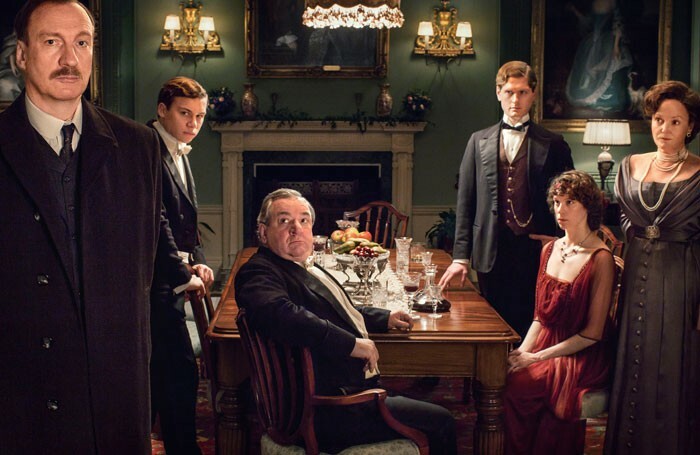 J.B. Priestly’s hauntingly honest ‘An Inspector Calls’ (1949) still rings true today. We are all responsible for one another. Full stop. A recent conversation in Wales made me think about this a lot. When I was in Cardiff for a weekend trip, I ended up chatting to a chap on the street (let’s call him ‘D’). After our discourse, I said goodbye and wished him all the best. As I turned and started walking away, D shouted my name. I walked a few paces back towards him and was confronted by two eyes that were open doorways to a world of pain and truth. They were staring straight at me, and into my bleddy soul, man. They somehow seemed synchronously serious, sincere, heavy, kind and honest. I had heard those words before. A few times, in fact. Yet, on this occasion, D’s sincerity, voice and stare made the message hit-home two-fold. He is right. If we are not part of the solution, we are part of the problem. You might think that you are small, but you can make a difference. Even the most miniature of men and women can treat people like … people. All we need to do is acknowledge other humans a bit more, whatever their situation. We are really not that different. Only our hearts, and how we follow them, make us so. Led by your heart, you can make a greater difference than you could ever imagine. You don’t know what people are going through. You don’t know the difference a smile, question, piece of fruit or greeting could make. You might post things on social media to ‘make a difference’, which is great – genuinely! All I’m suggesting is to look around you too. Alice would not have had quite the transformative journey she’d had if she were glued to her phone, busy scrolling through Facebook, Instagram and deliberating whether to swipe left or right on Tweedledee. Alice learnt a lot, made some kind of difference to others and grew herself (physically and metaphorically) because she was curious, looked around her and reached out. We can grow too. Let’s learn from her. Let me ask a couple of questions, one more time. If the looking glass was facing you, how would others see you and how would you see yourself? How can we practise kindness, relating to these topics? The next time you walk past a homeless or poor person and a judgemental thought enters your mind, try to catch it. Grab it, unpick it and destroy it before it becomes a big part of your locus of identity. What Sue says about Sally says more about Sue than it does Sally. Before you believe the hateful side of yourself, start examining where it comes from. This is a personal journey and it is different for us all. Yet there is a strong likelihood that it’s a cousin of fear. Going back to distance, let’s remove or lessen it. But how? Let’s start by developing awareness, kindness, empathy and mindfulness. Some things may seem unconscious at first, but we can make ourselves conscious. Let’s wake up, basically. Then, we can make small behavioural changes that impact others. For many people, this is instinctive, whereas others may have fallen into bad habits and may need to (re)learn some things. But that’s okay! It’s never too late for people to turn their lives around and it’s never too late for all of us to make some changes too. So, with this in mind, next time you’re walking to work, looking down at your phone, try looking around you. When you feel yourself avoiding eye-contact with that person on the floor, smile or give eye contact and say hi. Ask for their name, if you end up chatting. He or she has a name. Hopefully they haven’t forgotten it by now because it might have been a long time since they have been asked. Maybe he’s called Dave, he loves criminology, the smell of old books, Smashing Pumpkins, painting and could be your most loyal friend, if only you would let him. He might end up being the one who won’t ignore you if you end up in his situation. The next time you have a big bar of chocolate, perhaps share a cube or two with people around you – homeless or not. You don’t know what difference that small act of kindness will make and how that lovely bit of serotonin may affect someone’s brain and mood. The next time you notice yourself doing something that negatively contributes to the whole ‘us and them’ shabbang, remind yourself that they are just people, we are not so different, and that life is unstable. We can’t change the instability of life. However, we can change how we respond to it, our attitude and how we treat those experiencing the most turbulent of waves. Instead of cowardly creating distance or putting up a barrier, remove it. If the person is actually dangerous, okay, maybe not. But the majority of the time they wouldn’t dream of hurting you; they only dream of your simple acknowledgement. Often, the barrier is not there to protect our lives. It is there to protect our selfish ignorance. Stop protecting your ignorance and start treating other humans around you like the people they are. We are all just people. Often the roofless are less ruthless than us and treat others with more kindness and less suspicion. We can learn something from everyone. Remember the looking glass, the importance of empathy and the fact that how we treat others is one of the most important things. ‘One of the deep secrets of life is that all is really worth doing is what we do for others’. Be affected. Don’t let ignorance and fear control you and win. Don’t stop the blossoming of friendships just because you have different circumstances. Don’t let society turn you into a hateful and fearful person. Stop looking for differences. Make small gestures. Look around you. Listen to people. Share your chocolate. Let’s destroy prejudice, judgement, the ‘us and them’ divide, stop deindividuation and dehumanisation and work towards a better future together. In this uncertain world, that’s all we can do. We can all change. And change something as a consequence. ‘There’s no use going back to yesterday, because I was a different person then‘. Carmody, D.P., Lewis, M. (2006). Brain activation when hearing one’s own and others’ names. Brain Research, 116, 153-158. Conrad, J. (1995). Heart of Darkness and Other Stories. Wordsworth Editions. (Originally published in 1899). Cooley, C.H. (1902). Human Nature and the Social Order. New York: Scribener’s. Darley, J.M., & Latané, B. (1968). Bystander intervention in emergencies: Diffusion of responsibility. Journal of Personality and Social Psychology, 8, 377-83. Haney, C., Banks, W. C., & Zimbardo, P. G. (1973) A study of prisoners and guards in a simulated prison. Naval. Research Review, 30, 4-17. Hogg, M.A., & Vaughan, G.M. (2005). Social Psychology. Essex: Pearson Education Ltd.
Hogg, M.A. (2008). Social categorization, depersonalization and group behaviour. In J. Suls & L. Wheeler (eds.) Handbook of Social Comparison: Theory and Research (pp.401-21). New York: Kluwer/Plenum. Kteily, N., & Bruneau, E. (2017). The politics and real-world consequences of minority group dehumanization. Personality and Social Psychology Bulletin, 43 (1), 87-104. Latané, B., & Darley, J.M. (1970). The Unresponsive Bystander: Why doesn’t he help? New York: Appleton-Century-Crofts. Latané, B., & Rodin, J. (1969). A lady in distress: Inhibiting effects of friends and strangers on bystander intervention. Journal of Experimental Social Psychology, 37, 822-32. Levinson, D. (2004). Encyclopedia of Homelessness (Vol. 2). SAGE Publications. Mead, G.H. (1934). Mind, Self and Society. Chicago: University of Chicago Press. Turner, J.C. (1975). Social comparison and social identity: some prospects for intergroup behaviour. European Journal for Social Psychology, 5, 5-34. Turner, J.C. (1978). Social categorization and social discrimination in the minimal group paradigm. In H. Tajfel (ed. ), Differentiation Between Social Groups (pp. 101-40). London: Academic Press. Vaughan, G.M. (1988). The psychology of intergroup discrimination. New Zealand Journal of Psychology, 17, 1-14. Very interesting! I enjoyed read it! A long read but worth it in every aspect! 😁 You, good sir, are a legend. Thanks. A long read but it is worth it!! Thank you for taking the time to read and comment, Robyn! 😊 Definitely! It really can. All the best to you.